Heidelberg is famous for its prestigious university, historic monuments and cultural achievements. But this city of 150,000 people in south-western Germany also won the European Sustainable City Award twice from the European Commission and received the 2015 Global Green City Award from the Global Forum on Human Settlements and United Nations Environmental Program as well as prizes for urban redevelopment, bicycle-friendliness, transportation innovation, climate protection, energy conservation and preservation of the natural environment (Heidelberg, 2016). Heidelberg is literally green. Of its total land area, only 29 percent is urbanized, while 27 percent is farmed and an impressive 41 percent is forested (Graczyk, 2015). 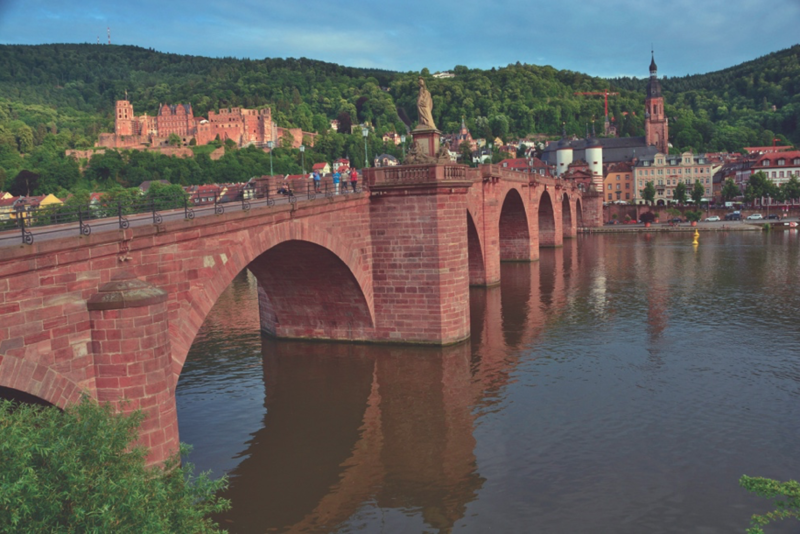 The historic city center hugs both banks of the Neckar River with the Odenwald Mountains and the Heidelberg Castle forming the City’s southern backdrop while the woods of Heiligenberg Mountain rise above Heidelberg University on the northern riverbank. To preserve this iconic setting, the City adopted an Old Heidelberg protective statute in 1997 that preserves the surrounding hills as well as the Castle and Old Town (Heidelberg, 2007). Figure 20-1: Heidelberg preserves its greenbelt, waterways and historic character including the 18th Century Old Bridge, now a pedestrian/cycle link over the Neckar River. To retain its green surroundings and provide efficient infrastructure, Heidelberg concentrates growth in areas near the city center and along public transportation routes. The City promotes infill growth, including the redevelopment of vacant or underutilized industrial land (Heidelberg, 2007). Most notably, Heidelberg transformed a former railroad freight yard into the Bahnstadt District, a new-town-in-town mixing residential units with office space, schools, a private university, movie theaters, kindergartens and retail stores as well as a building called Sky Labs which serves as a center for science and technology. 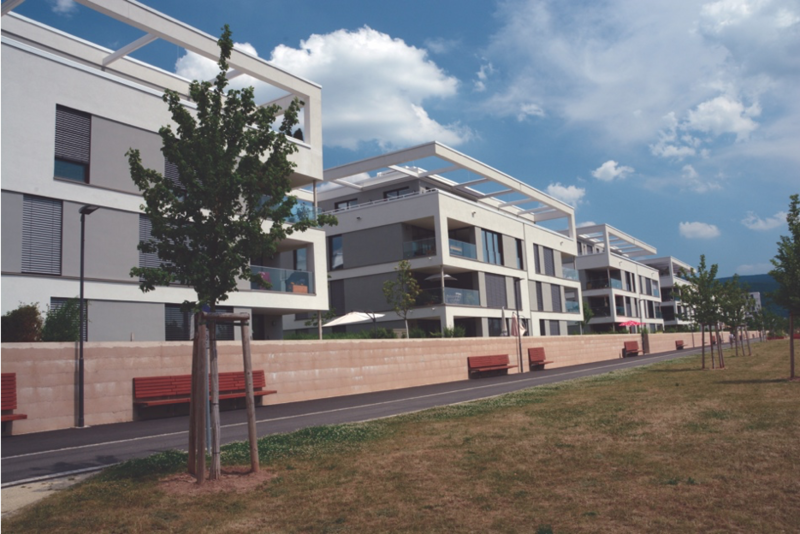 In addition to putting residents next to their daily needs, Bahnstadt saves energy by requiring all buildings to meet extremely low “passive house” efficiency standards (Lisella, 2014). With an area of 116 hectares, Bahnstadt is the world’s largest passive house district (Passive House Institute, 2014). Heidelberg aims to slash energy consumption in existing and well as new buildings. 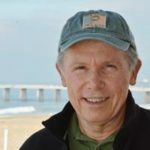 In 2000, Heidelberg’s Mayor for Environment and Energy initiated formation of the regional Energy Efficiency Agency with the goal of saving 6 million kWh annually by retrofitting three percent of the region’s older buildings every year. Beyond the benefits to energy consumption and CO2 emissions, this project aims to create 1,100 jobs and inject $110 million euros of direct investment into the local economy (ICLEI, 2007). Figure 20-2: Bahnstadt is the world’s largest passive house district. Heidelberg takes a highly creative approach to conserving energy in its own public buildings, allowing private energy retrofit companies to keep up to 80 percent of the savings generated by energy conservation projects. Residential units built on city-owned land must meet strict annual energy conservation targets of 65 kWh per square meter for single family homes and 50 kWh per square meter for units in multiple family structures (Beatley, 2000). Since 2001, 25 percent of the energy supplied to Heidelberg’s city-owned properties has come from alternative energy sources. This amounts to 7 million kWh per year, making Heidelberg probably Germany’s largest buyer of green electricity. The extra cost of this alternative energy represents additional revenue for the City’s power supplier, which invests this money in alternative-energy improvements including photovoltaic systems on schools and a biogas heat/power plant at the zoo fueled by animal waste (Herrmann, 2002). Heidelberg’s transportation policy rests on a goal of building a City of Short Distances. Mobility is greatly improved if homes, jobs, schools, recreation, shopping and other everyday needs are close together. Additionally, as called for in the City’s 2015 Land Use Plan, proximity allows streets to be transformed into “living space” (Heidelberg, 2007). To prove that this ideal is achievable as well as desirable, Heidelberg can point to its own Old Town, where most streets are reserved for pedestrians. In particular, Hauptstrasse, Old Town’s mile-long, pedestrianized “main street” has been ranked with other world-class “great streets” like Barcelona’s La Rambla for its human scale, architectural richness and diversity of uses (Beatley, 2000). Heidelberg was an early adopter of traffic calming techniques as a way of increasing safety, encouraging non-motorized mobility and reducing CO2 emissions. The Kirchheim neighborhood showcases increased infrastructure for pedestrians, bicyclists and trams in conjunction with reduced roadway space for private automobiles. Some roads in Heidelberg limit traffic to seven km/h (or slightly more than four miles per hour), forcing motorists to slow down and respect walkers and bicyclists (James and Fereday, 1999). Traffic calming in Heidelberg has produced a 31 percent reduction in accidents and a 44 percent decline in casualties (Beatley, 2000). In addition to awards for climate protection, ecomobility and sustainable redevelopment, the Heidelberg region’s mammoth Geo-Naturepark Bergstrasse-Odenwald was included in the UNESCO Global Geopark network officially formed in November 2015 (EGN, 2016). Geo-Naturepark Bergstrasse-Odenwald extends between the Neckar, Main and Rhine rivers, encompassing 3,500 square kilometers of countryside as well as about 100 municipalities including the City of Heidelberg. Initially established in 1960 as one of Germany’s first nature parks, Bergstrasse-Odenwald provides conservation of biodiversity, environmental education, sustainable tourism and a greenbelt that guards against potential sprawl while serving as a recreational venue literally at Heidelberg’s front door. 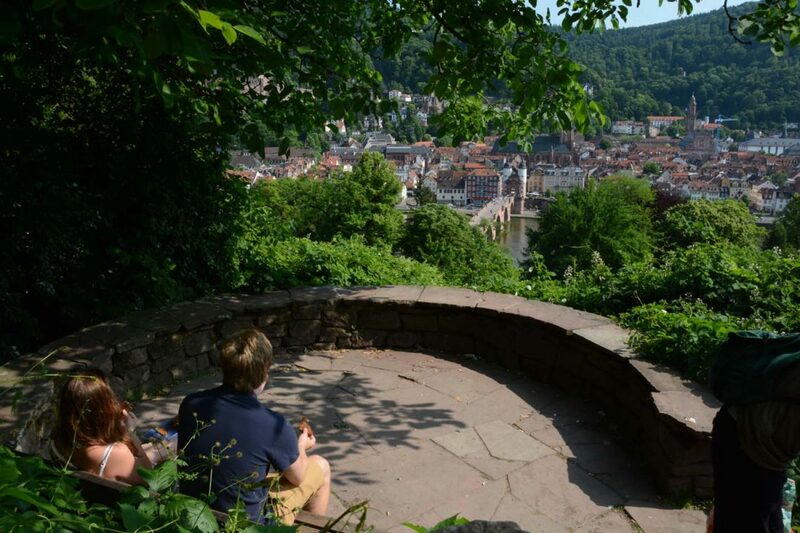 From the Old Bridge over the Neckar River, hikers and mountain bikers can use the centuries-old Philosopher’s Walk to climb the hill overlooking Old Town Heidelberg and wander around a 10,000-kilometer network of signposted trails (EGN, 2013). Beatley, Timothy. 2000. Green Urbanism: Learning from European Cites. Washington: Island Press. EGN [European Geoparks Network]. 2013. The Geo-Naturepark Berstrasse-Odenwald. Retrieved on March 20, 2016 from http://geopark.come-to-web.net/en/service/infomaterial.php and https://translate.googleusercontent.com/translate_c?depth=1&hl=en&prev=search&rurl=translate.google.com&sl=de&u=http://www.geo-naturpark.net/deutsch/wir-ueber-uns/was-ist-das.php&usg=ALkJrhhYvLYf-8kkCwAxNXWgoZtAS3xCWg. Graczyk, Alice. 2015. Implementation of Sustainable Development in the City of Heidelberg. Acta Universitatis Lodziensis Folia Oeconomica. 2 (313). Heidelberg. 2002. Heidelberg – Where Do We Stands, What Are Our Achievements? A First Report on the Implementation of the Heidelberg City Development Plan 2010. Heidelberg: City of Heidelberg. Heidelberg. 2007. Heidelberg City Development Plan 2015. Heidelberg: City of Heidelberg. Heidelberg. 2016. Prizes and Awards Received by City of Heidelberg. Retrieved on March 16, 2016 from http://www.heidelberg.de/english,Len/Home/Live/Prizes+and+Awards.html. Herrmann, Silva. 2002. Awarded Projects within Climate Star 2002. Frankfurt: Climate Alliance. Retrieved on March 20, 2016 from http://www.klimabuendnis.org/fileadmin/inhalte/dokumente/ClimateStar2002_awardedProjects_en_01.pdf. ICLEI [International Council for Local Environmental Initiatives]. 2007. Energy Efficiency through Environmental Management in Heidelberg, Germany [Nomination for World Clean Energy Award]. Retrieved on March 20, 2016 from http://www.cleanenergyawards.com/top-navigation/nominees-projects/nominee-detail/project/25/?cHash=d75a11ace5. James, Norman and Fereday, Davina. 1999. Changing Travel Behavior. Lichfield, UK: Transport and Travel Research, Ltd.
Lisella, Maria. 2014. Romantic Heidelberg;s Groundbreaking New Life as Germany’s Silicon Valley. German Life. February/March 2014. Passive House Institute. 2014. Award for Heidelberg Passive House district now visible in the cityscape. Retrieved on March 19, 2016 from http://passivehouse-international.org/upload/2014_06_30_Bahnstadt-Heidelberg_Press_Release.pdf.